One of the topics that came up at my recent writer’s group meeting was the commonly repeated fear that someone, somewhere, will steal your idea. The writers in my group are all experienced, and the “stole my idea” topic was little more than a throwaway, something we discarded before moving on to something more substantive. But for newer writers, or people who are thinking about writing, that idea seems to pop up with regularity. Why? You cannot copyright an idea. Ever. That’s what lawyers call a “black letter” law. There’s no wiggle room in it. It’s black letter because you can write it in ink and never have to change it. Ideas are, legally, worth nothing. In order for you to copyright something, you have to create something that is original and affixed or attached to a medium. Basically, you have to write it down. When you first start writing or first start along the path of the creative process, ideas are something that seem a lot more important to you. “I’d love to write a novel, but I don’t have a good enough/big enough/unique enough idea.” How many times have you heard or thought that? It’s fear talking: fear of climbing a mountain that looks so big, fear of doing something that seems so impossible, fear of the unknown. After all, that’s what a novel is, isn’t it? Getting an idea that’s so good, so awesome you just have to write it down. The idea is the most important thing ever, and writing the book is just what happens after. Once you get the idea, the book practically creates itself, right? Average length of a novel: 80,000 words. Average time it takes to write a first-draft of a novel: 321 hours. Or 107 days and 3 hours. Just over three months. And even at the end of all that work, you don’t have a book. You have a manuscript. You need to then edit that manuscript. Then edit it some more. Then look for an agent, or a publisher, or try to publish it yourself. And if you do all that, there’s no telling if you’ll sell 10, 000 copies or 10 copies. There are people who think that someone might steal their perfect idea. There are people who come up with an idea and who just need a writer to write it down. There are people who guard their book ideas so closely they’re scared to tell other people about them. These are people who have no idea what they’re talking about. 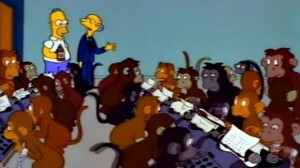 Mr. Burns will be the best writer in the world. 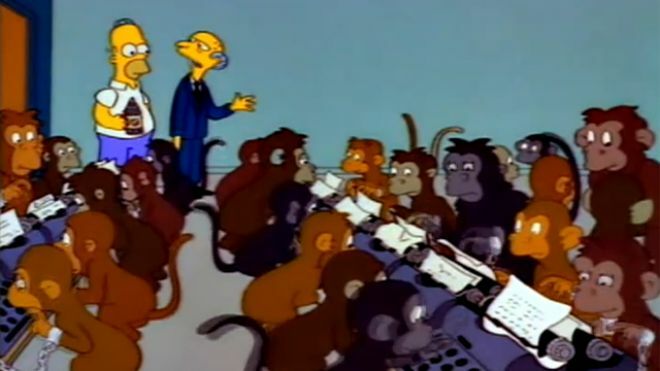 Given enough time, ink, paper, and immortality, a million monkeys at a million typewriters will create the best book ever written. And that book has nothing to do with the original idea. It’s all about execution. How do I, or you, know this? Imagine the following scenario: You are in a room with 19 other writers. Each person writes down one idea on a slip of paper, places it in a hat, and then gives the hat to you. You pull out one of the ideas and tell the group what it is. Maybe it’s your idea, maybe it isn’t. But it’s the only idea you get to write about. You have to write a short story about that idea. You have to write a play about it. A screenplay. An essay. A novel. Whatever. The point is, you and 19 other writers have to write something about the same idea. How many different stories do you think you will get? If you say 20, that’s a safe bet. If you say 15, you’re probably selling yourself short. If you say anything less than 10, you’re paranoid and need to speak to someone. Every writer is different. Every story is different. Are there similarities in subject matter, style, tone, or narrative between similar stories? Of course. But those are stories. And stories are not just an iteration of an idea. Some of those 20 writers will be good. Some will be bad. Some will be remarkably bad. Some will start a book and some will not. Most who start won’t finish. Most who finish won’t ever come close to finding an agent, much less publishing. And, if that snowball makes it through hell and gets published, someone who publishes will have written a book that’s so different from yours that you’ll wonder how in the world he/she came up with it from the exact same idea that, for you, produced nothing but headaches, frustration, and a story that only your mother likes.